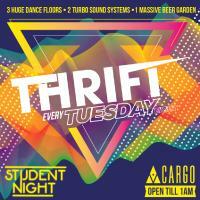 Let loose and carouse - Cargo brings you your new favourite Wednesday night out! To buy tickets for this event please visit the events page: Thrift event tickets. Thrifty Tuesdays, for Thrifty Students! Tuesdays in Shoreditch will never be the same. This November we are bringing you a brand new, shiny, perfectly polished pearl of a party – THRIFT. We will be playing the best of Commercial Music all night long. And we will play it the way it’s supposed to be – LOUD. We have amazing turbo sound systems and DJs who are not afraid to pump the volume up. We also have some sweet drink deals that, I promise, will make you smile. Happy Hour will roll for the whole night now. In addition to that we have something special for students. Show your NUS card at the door, grab the wristband and enjoy £2.50 singles, beers and wines all night long. We want this party to represent everything that is right about Shoreditch. A bit too loud, a bit too cheap. You can obviously contribute – with your outfit to say the least. Think Cruella de Vil meets Spongebob Squarepants. Got it? That’s your Tuesday clothes now. There are three huge dancefloors to populate so don’t hesitate to invite your friends. We also have a great, heated beer garden if you want to make it more social. Either way, it’s gonna be great.